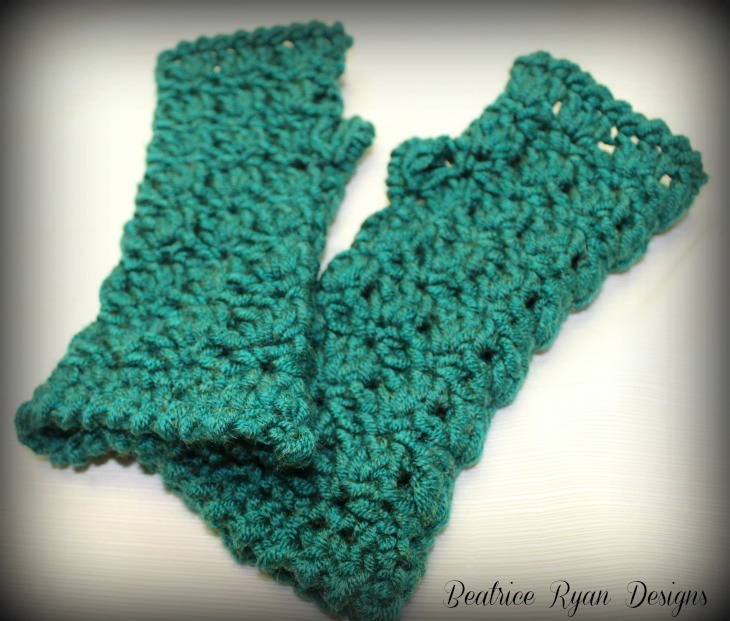 Amazing Grace Fingerless Gloves… Free Crochet Pattern! 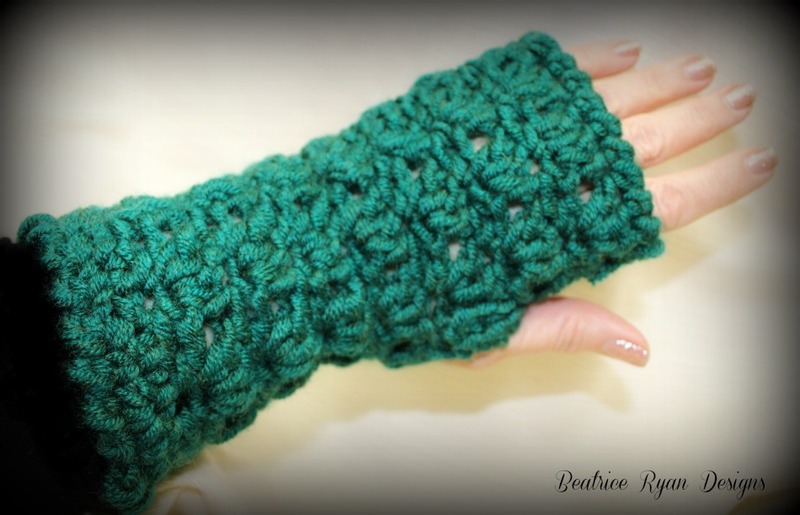 The Amazing Grace Fingerless Gloves are the 12th Free Crochet Pattern in my Amazing Grace Free Pattern Series! If you are new to my site, This series is dedicated to Breast Cancer Awareness and my dearest friend Sandra Kay Gilb who lost her battle to cancer in 2007. Please consider paying it forward by donating one of the items you make from these patterns to someone who is suffering or recovering from and illness or life event. For more on the Amazing Grace Free Pattern Series and my story, click on the tab at the top of this page. *Tip ~ You will be working in the round. Row 10 – Thumb space row: Ch 9, Sk St, Sl St in next 3 Sts, Ch 1, Sc in the same St, Ch 2, Sc in same St, Sk 2, *(Sc,Ch2,Sc) in the next St, Sk 2 Sts*, Repeat * * 4 more times. Join with Sl St to the beginning Sc. =6 ch 2 Spaces and Ch 9 Space. Row 12: Sl St in next 4 sts, Ch 1, (Sc,Ch 2,Sc) in the same St(This is the middle stitch of the 9 Scs), Leave the last 4 Sc unworked and Sl St in the top of the next Dc(Ch 3 beginning Dc), Sl St in the next St, Ch 1, *(Sc,Ch 2,Sc) in the next St, Sk 2 Sts*, Repeat * * 4 more times. Join with Sl St to the beginning Sc at the top of the Thumb space. = 7 ch 2 spaces. Row 2: Ch 1, Rev Sc around. Congratulations!! You now have a Pair of Amazing Grace Fingerless Gloves!! These are beautiful, and look nice and warm. Pinned! I just finished a pair of Amazing Grace Fingerless Gloves and they are beautiful. I made an ear warmer head band to match. Having 25 grandchildren, 27 great grandchildren and now my first great great grandchild l do a lot of crocheting, knitting and sewing to make gifts. It is a wonderful pass time and I look for free pattern because I live on SS income. I watch for sales on yarn and if I have a like extra money I buy 1 or 2 skeins of yarn, just enough to make small item. The left over yarn I make granny squares and when I have enough for a blanket I sew them together for a blanket. I have an old steamer trunk and I keep the things I make in it. I call it my treasure chest. A granddaughter and her husband came to visit this past spring and I told her to go into the trunk and take things for each member of the family. Their are 11 members of my family in Florida. She is keeping them for Christmas gifts to give from me. I want to thank your sight for posting such beautiful patterns at no cost so that I can continue crocheting and knitting. I do make things for charity, also. Mittens, hats, baby blankets and baby caps.i am 81 and as long as the Lord leaves me on this earth I will be making items. Bless your heart for all you do. Your family has a treasure of a grandma . I never got to meet my grandparents .I think back sometime and wonder what it would have been like. Now I’m a grandmother to 8 of my own.God bless you. I have 2 grand sugars and treasure every minute I get with them!! Hi I made a pair of these. They are beautiful but I found them too small for me. How do I adjust pattern to make slightly larger? I would like to thank you for your beautiful free patterns. I am going to make the amazing grace fingerless gloves for my granddaughter who was diagnosed with leukemia in August 2014. I have crocheted a beanie cap, slouch hat, scarf and now she will have gloves. Again thank you so very much. I am so happy they are something you would use!! I am wondering if these can be made in a worsted weight yarn. I made my sister an Amazing Grace Blissful Beanie in I Love This Yarn Navy and would love to make her a pair of these to go with it. I wanted a pair to match the hat that is made with worsted weight yarn and an H (5mm) hook. I increased the initial chain to 28 (note that the pattern is multiples of 3 plus 1), which increases the number of single crochets from 21 to 27 and chain 2 spaces and 3dc clusters from 7 to 9. I also added two more sets of rows 4 and 3 before the thumb space row and one more set after. I followed all instructions otherwise. I ended up with gloves that, on me, fall on the same places on the arm and hand as the reference picture. My gloves came out to 10 inches long and almost 9 inches around on the outside. I used Lion Brand Heartland yarn. Hi I was wondering would it be easy enough to add a cuff to these fingerless gloves ?